Product #3196 | SKU DMC842M | 0.0 (no ratings yet) Thanks for your rating! 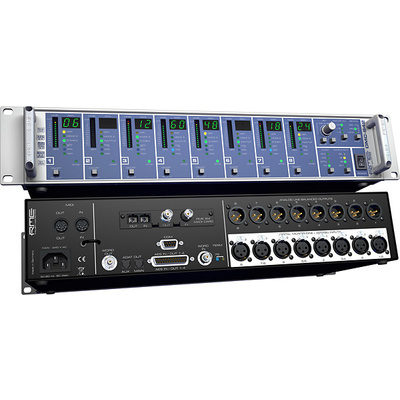 The DMC 842 Remote controllable interface for digital microphones with 164 MADI card included. The I64 MADI Card provides the DMC-842 with a 64-channel MADI input and output. The coaxial and optical outputs operate in parallel to the AES/EBU and ADAT output and deliver the same data. They also provide full redundancy by automatically switching from one input to the other in case of loss of one of the signals. The MADI input can operate as an optional clock source as well as a through-input. Since each DMC-842 uses only 8 channels, up to 56 channels can be passed through. This is used to serially cascade several DMC-842s, allowing up to 8 devices to be connected serially. All 64 combined channels are available at the last device's MADI output.